5 litre jug of Ilford Hypam Fixer concentrate. 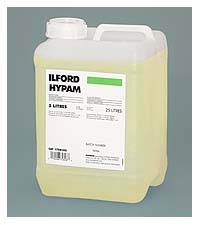 Ilford Hypam Fixer is a non-hardening rapid fixer supplied as a liquid concentrate that is diluted with water for use. It is easy and convenient to use for fixing black and white films and papers, and can also be used for fixing other specialist, X-ray, scientific products and graphic arts materials. For detailed information on Hypam Fixer, please refer to the Technical Information PDF.